NYMEX WTI is losing momentum, sliding below $60 barrel. 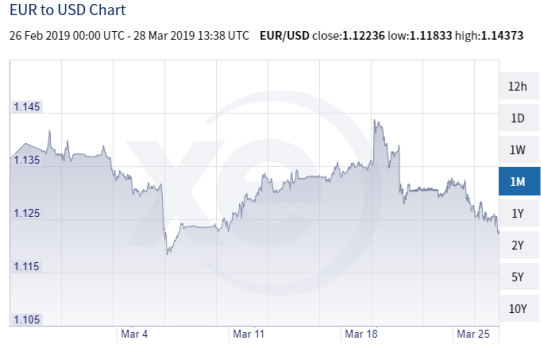 EUR/USD continues to trade with a negative sentiment as the market is grappling with new fears of a looming recession. The growth of the German economy has stalled and a further slowdown in the Chinese economy could send more shockwaves to its trading partners. The pair is set to close the month in negative territory for the third month, losing nearly 2.4% alone this month. The outlook remains bearish for the euro. A failure to bounce from here could push the pair to levels last since the beginning of the month. Investors prefer to stay away from the Sterling as the House of Commons sinks into deeper political morass. The MPs somehow managed to find no consensus on eight alternative options to the current Withdrawal Plan from the Theresa May. It is now unlikely that there will be a third Meaningful vote this week, meaning that Brexit for April 12th is on the cards. We could then see a scenario of a No Deal exit (which the MPs don’t want) or a longer extension if they are able to “indicate a way forward”. GBP/USD tightens further with a bearish outlook. EUR/USD is looking for a new bottom today, dropping to a new three week low. The pair is trading along global market sentiment which has swung to fears of a recession and sliding German bund yields. Brexit is also acting as a major drag on the prospects of the shared currency. We continue to believe the pair is currently sitting close to key technical levels and a further drop could signal more bearish follow through. USD/CAD continues its consolidation theme for the fourth session. A shortage of quality economic data and cautious approach adopted by investors are the main drivers behind recent tight trading ranges. Meanwhile, crude oil futures failed to maintain its momentum above the $60 barrel mark, falling another dollar today. We expect volatility to pick up tomorrow with the release of GDP reading. AUD USD has been trading in a fairly tight range over the past few days. The NZDUSD and NZDAUD plunged by 100 points after the ‘rate cut’ bias hit the wires yesterday, and only staged a modest bounce. The local equity market rejoiced and surged 1.2% higher. US dollar has bounced back from the session’s low but remains very sensitive to volatile swing in investors’ sentiment. Japan is releasing a slew of data later today: retail sales, unemployment rate and industrial production numbers are likely to inject more trading impetus. For now, we expect the focus to be on the behaviour of the US Treasury yield curves.